This post may contain affiliate links. Please read my full disclosure policy here. Solo parenting: n. Caring for your children without the day-to-day hands-on help of a partner. Differs from single parenting because you do have a co-parent who can presumably provide emotional and/or financial support from afar and who still needs to stay connected to the family while away. I definitely know that there are people who have it worse–who aren’t able to share parenting duties at all–and I am grateful for my 238 days. I have found solo parenting to be trying during the times my husband is gone, though. Behavior problems are often magnified in small kids who can’t articulate that they’re bummed that Dad isn’t home. There is little opportunity for a break from the kids—even in the evenings and on the weekends when parenting duties would normally be shared. Keeping everyone ‘connected’ is challenging, too, and there’s a risk of jealousy and resentment all around. We don’t live close to any family, and not having a spouse around has often resulted in times when I needed another set of hands. Don’t be afraid to ask for help from family, friends, neighbors, or professionals. Once, a neighbor picked up supplies for me and dropped them on my front porch when my 4-year-old was too sick to leave the house with me to get it ourselves. Another neighbor watched my boys for a few minutes when my babysitter overslept and I had an appointment I just couldn’t miss. I am grateful for my ‘village’ all the time, but never more than when my partner is away. Work schedules, time zone changes, and kid routines can wreak havoc on regular communication, leaving the family feeling disconnected. Snapping and sending a quick picture or writing a brief text can help keep the traveling parent in the loop. A quick FaceTime date to show a LEGO tower that has just been built or to share a chat while eating a bowl of cereal keeps communication low-pressure while keeping the traveling parent in the loop. We often have trouble with the kids flaking out during FaceTime calls because they occur in the middle of a favorite game, at night when they’re overtired, or in the morning when they’re still waking up. To combat the problem of the parents being ready to talk when the kids weren’t, we invested in a couple of Toymail talkies. These neat little guys look like stuffed animals, but they hide a little messaging system inside. Using a set of three simple buttons, kids can select a contact (who’s been pre-approved by the parent), record a quick message, send the message to the contact, and hear the response. Learn more about this cute little guy here. It’s been really great for my kids to be able to send an “I love you” when they’re lying in bed at night about to fall asleep without having to ask me to write a text, take a picture, or try to get Daddy on the phone. If a FaceTime or phone call has to be abandoned because the kids just aren’t into it at that moment, the kids will still have a way to communicate later that day. When my husband is away, I make the best of the time by doing some of the things I want to do but don’t always have time for when he’s around. It might be something productive like sorting through toys we need to purge. It could also be something fun like reading a new novel, spending some extra time on my guitar practice, taking a bubble bath, or binge watching a show I know he wouldn’t be wild about. Tackling the big things on my to do list gives me a major sense of accomplishment, and saving some little treats for when he is away gives me something to look forward to when he isn’t here. When my husband is here, dinners tend to be relatively elaborate, meat-and-potatoes kind of dishes. When my husband is away, dinner might be a simple tuna salad sandwich (he hates tuna and the kids love it) with some cut veggies on the side. Our Friday night pizzas from scratch utilize English muffins and sauce from a jar rather than the homemade sauce and dough I make every week when everyone is home. In short, you might notice more challenging behavior than usual. My friend Mary, who solo parents frequently, has noticed this phenomenon, too. She sends a note to her daughters’ teachers when her husband is traveling to warn them that there might be extra discipline issues and ask that the teachers keep her in the loop. Do your best to give your kids the benefit of the doubt, to make some time for extra snuggles, to let your kids know that you also miss your spouse, and to highlight some of the fun opportunities you have when the other parent is away. You might even plan a special outing from time-to-time for a treat. Bonus points if it’s someplace you’d enjoy, too. Just like the kids, you’re probably feeling sad, lonely, and overwhelmed. Whether you drink a glass of wine, repeat an affirmation, or allow yourself a good cry, think of small ways to be kind to yourself while you’re in the trenches. It can sometimes feel tempting to hibernate in your jammies in a chaotic house while your partner is away, but adding in some extra friend time can help everyone feel less lonely, sad, and stressed. When my husband is away, we often invite other families over for dinner and a play date—especially other moms who are parenting solo. It’s a great opportunity for the kids to have fun and for the moms to get a little kvetching time. Does this break in the family routine allow you to do any easy and fun stuff that you wouldn’t normally do with your kids? We like to shake things up at mealtimes by having a picnic, eating early to allow time for a board game tournament, or watching a movie during dinner. We’ll make bedtime fun by staying up a little later than normal, adding glow sticks to our bath water and bathing in the dark, or having a mom and kids slumber party in the boys’ room. As a self-confessed perfectionist, this one is tough for me, but it’s vitally important. When you don’t have a spouse to hand off to, trying to maintain “business as usual” can seem pretty overwhelming. Ideally, you might sweep your floor everyday, only eat organic foods cooked from scratch, and not allow your children near any screens. However, your standards are not more important than your sanity. It’s ok to relax your policies for a bit. Realize that everything probably won’t get done the way it would if there were two people at home, and that’s ok. 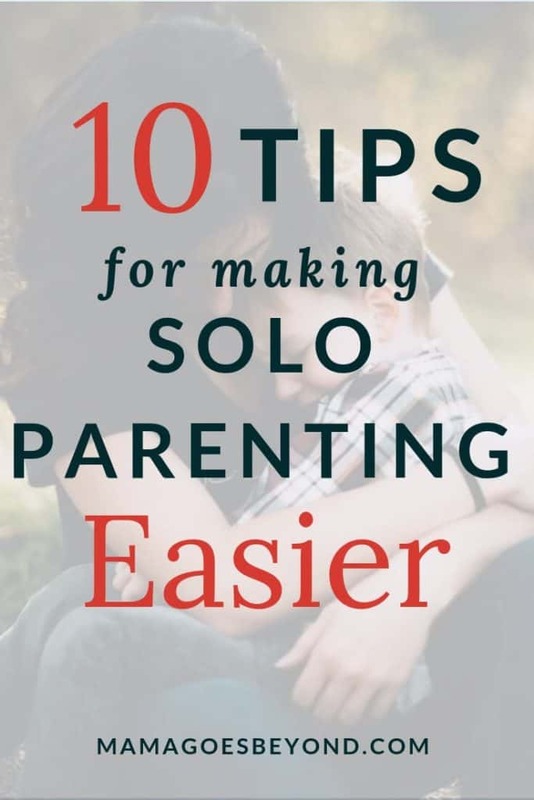 So, there are some strategies for rocking solo parenting while your partner is gone. The bad news is that you’re all in for another upset when the traveling partner comes back. Re-entry comes with its own set of pitfalls, and I’ll give some strategies for dealing with it in a future post. 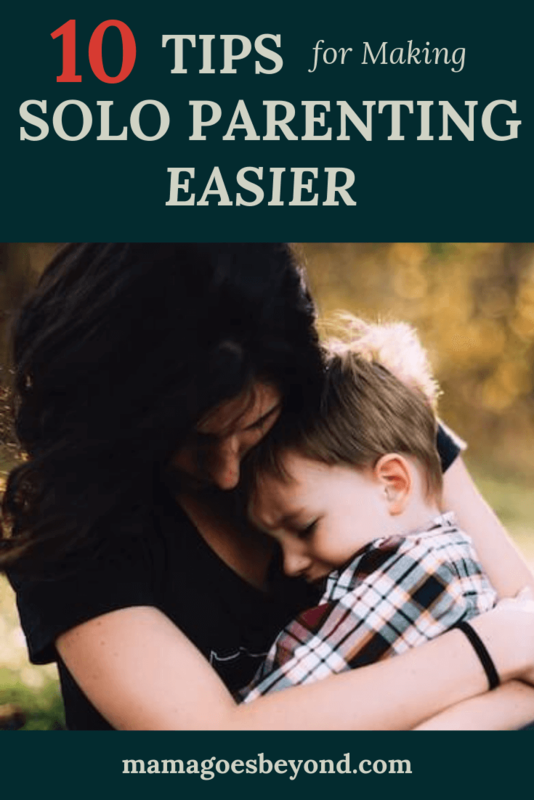 Do you spend much time solo parenting? If so, do you have any awesome tips that I missed? This is such an important topic. Great read, I will be sure to share this to a few loved ones of mine. Thanks for the great tips. My man is currently traveling and this is exactly what I needed. I totally recognize the ‘make it a party’ part. I moved the big bed against the wall and move my little girl’s bed next to the big bed so waking up is a party for her. Slumber party! Hang in there while your guy is away, and don’t forget to read the tips on coming home that I posted. Sometimes coming back is harder than being away! I’m away from my husband at least one night a week due to our schedules, and these are great tips! We do FaceTime and Snapchat when we are apart and send tons of sickeningly sweet texts. I will say, it honestly seems like the house stays cleaner when he’s away… hmmm… 🤨 lol but I definitely agree with discipline is harder without his big booming voice in the home! So glad you liked the tips. Thanks for taking the time to comment! Great tips! Thankfully my husband doesn’t travel too often for work, but we also will do the divide and conquer method for planning out a couple of weekend getaways with friends. By the end of a trip, I am ready for him to return! You are definitely making me feel like I need to plan a girls’ getaway. Thanks for your comment! Enter your email below to receive receive weekly updates from Mama Goes Beyond. You’ll also receive access to my password-protected Subscribers’ Resource Library. It includes lots of fun freebies related to parenting, homeschooling, family travel, and self care.